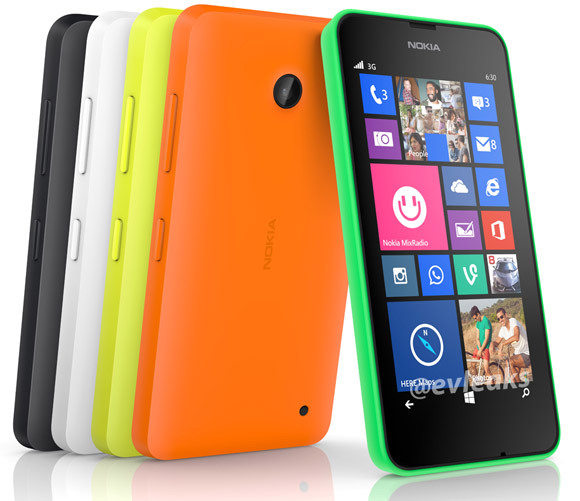 The Nokia Lumia 630 will give the entry-level segment of Nokia’s lineup a big boost. New rendered images give us the clearest look at the device to date and it could easily pass for one of the new Nokia X devices. While similar, the Lumia 630 will offer better specs - a 4.3” WVGA screen, Snapdragon 400 chipset with a 1.7GHz processor and 1GB RAM. The Lumia 635 version will feature LTE connectivity, putting it well ahead of other affordable phones. The base 630 model will be a dual-SIM phone, a first for Windows Phone, because dual-SIM support will only come with the WP8.1 update. Note that the back of the phone lacks a flash for the camera (with rumored resolution of 8MP). The Lumia 620 did have a flash, while the 520/525 models do not. This is a strange thing to downgrade this aspect, considering all the other major bumps in specs, but as with all rumors nothing is certain. Nokia reportedly has an event scheduled for April 19 where we expect to see the Lumia 930, the GSM version of the Lumia Icon (perhaps with a smaller screen), and the Lumia 630/635. If Nokia included camera button and flash, no one will be bothered to buy 620,525 and even 720.
nokia is still coming with same features like 5mp camera without flash, dual core processor, and small ram(512mb). nokia has to improve in some segments like camera, processor, ram and battery. I still wonder if this company looks at the competition.